Jackson Hole Experience Group brings you the mobile Jackson Hole Gold Panning Experience! Many people are looking for a fun and unique way to add value to the lives of those they care about. Corporate groups – What a fun way to give bonuses that your staff will remember – real GOLD! Families – Your kids will learn the value of working elbow to elbow with you panning gold – and they will have real gold to take home! Dates – What could be a better pre-dinner date than panning for gold? What might she find in her pan that is made of gold and/or diamonds? Our friendly guides come to your home, resort or other venue and help you provide the people you care about with a fun, unique experience! Call, text or email our friendly Booking guru to schedule a 2-hour experience. We will walk you through the booking process, asking about the size of your group, what amount of gold you would like to have available for discovery in each pan and will take your credit card information. Your guide will arrive at your home, resort courtyard or other venue about an hour before the start time and will set up our table, sluice tubs, pans, water, sand and other resources. At the scheduled start time, your guide will teach your group how to pan for gold, will practice technique and then you will all pan for real gold! Plan for some water to splash on you, plan to find real gold and plan to have a relaxing and rewarding time! Some groups prefer a few flakes of wonderful success, some corporate groups prefer varying amounts of gold for each person, perhaps 5 people will have pans with $50 in gold value, and one will have a pan containing $2500! perhaps a bachelorette party will have custom gold pendants discovered in each pan? 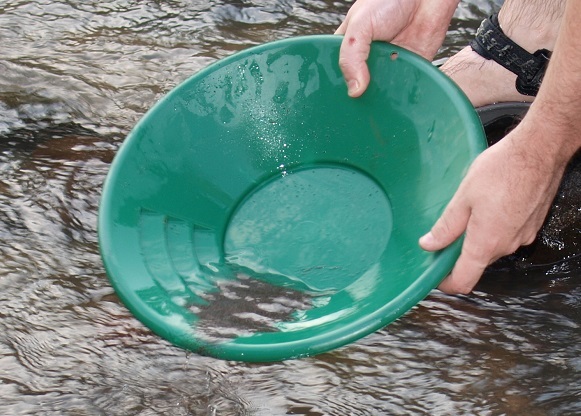 Gold panning is a rewarding process. Once a suitable placer deposit is located, some alluvial deposits material (sand) is scooped into a pan, where they are then gently agitated in water causing the gold to sink to the bottom of the pan. Lighter material is allowed to spill out of the pan, whereas materials with a higher specific gravity (heavier stuff like gold) sink to the bottom of the sediment during agitation and remain within the pan for examination and collection by the prospector. These dense materials usually consist primarily of a black, magnetite sand and gold! While an effective method with certain kinds of deposits, and essential for prospecting, even skilled panners can work through only a limited amount of material, significantly less than the other methods which have replaced it in larger operation. Pans remain in use in places where there is limited capital or infrastructure, as well as in recreational gold mining, which is what we provide to you! In many situations, gold panning usually turns up only minor gold dust that is usually collected as a souvenir in small clear tubes by hobbyists. Nuggets and considerable amounts of dust are occasionally found, but panning mining is not generally lucrative out in the wild. Here at the Jackson Hole Experience Group, we seed the sand with your preferred quantity of gold flakes and nuggets. Founder Shepard Humphries having fun practicing and refining this Gold Panning Experience!